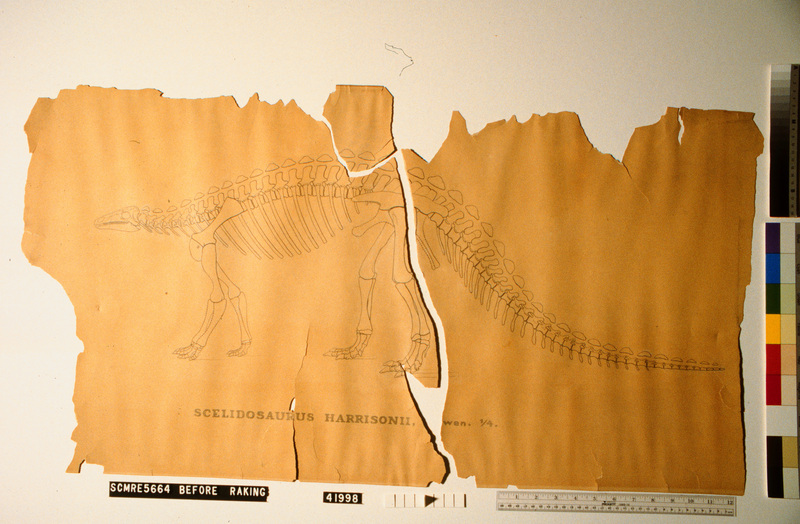 Paper conservators at the Museum Conservation Institute worked with the staff at the National Museum of Natural History Paleobiology Department to rescue a collection of original dinosaur drawings belonging to the archive of famed paleontologist O.C. Marsh at the Smithsonian Institution. This project started with the "Angels Project" which serves as a case study for building preservation issues into collections care in the following areas: management, access, environment, collections maintenance, stabilization through conservation treatment, research and staff training. For more information on preservation of collections see RELACT, Problems and Solutions. The present site is a pilot project to explore the pros and cons of making such a collection accessible through reproduction, especially in digital form. 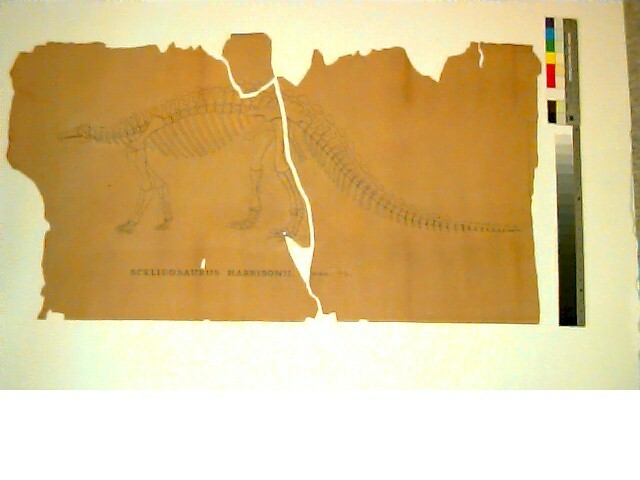 Some of the dinosaur illustrations from the O.C. Marsh Collection are too big and fragile to be regularly accessed by researchers. They are brittle from age and deteriorating from inadequate storage over the years. 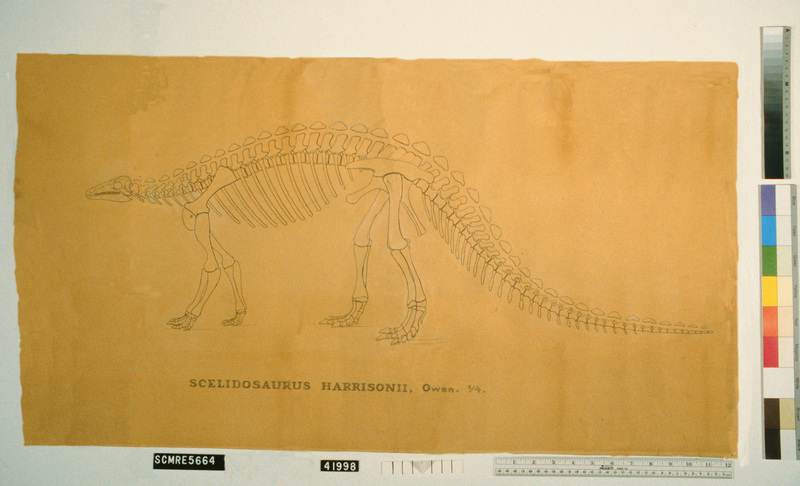 This drawing of Scelidosaurus harrisonii is one of the many beautiful, carefully rendered drawings that are in the collection. 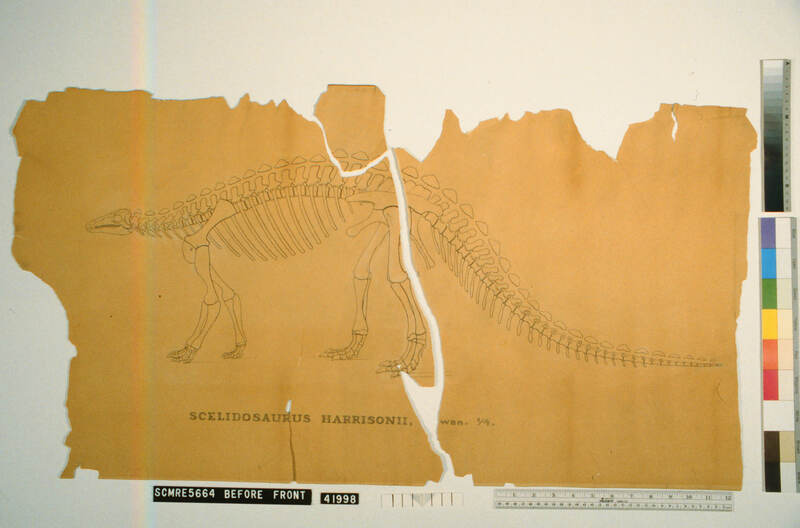 The Scelidosaurus was discovered and named in 1859 by eminent paleontologist Sir Richard Owen and this skeleton drawing appears to have been made for research purposes by Marsh. It is large, damaged and difficult to handle. One good way to let people see these pictures is by capturing the image by photography and publishing the pictures on the Internet (1). Showing pictures on the Internet is a useful tool to researchers. Does it show the whole picture? The answer is no! There are many pieces of information which are inaccessible when a picture is digitized (2). For instance, what does the back of the illustration show? Many times when drawings are digitized, the back (or verso) is not shown. The back of a drawing can show marks of provenance like signatures and hand-written notes, or simply additional signs of age. 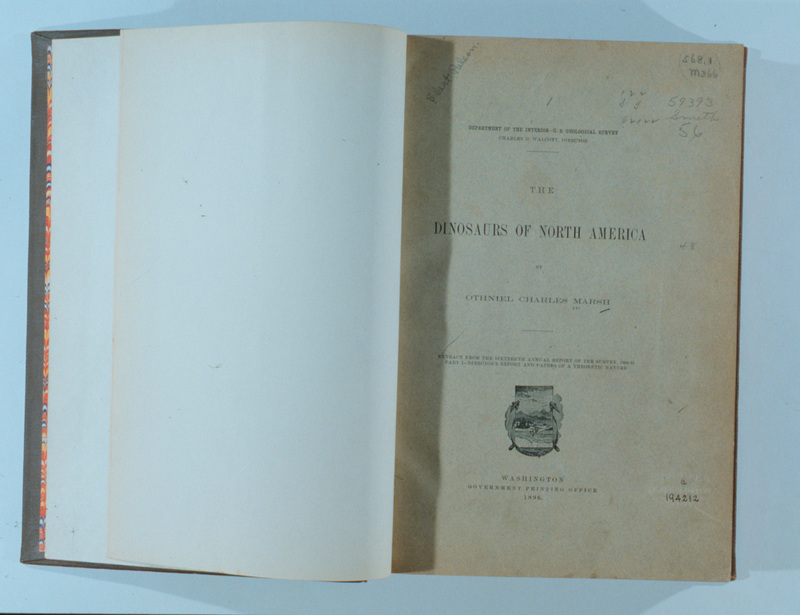 These are indications of a history of use, or the preservation condition of the paper. The lines on the back of this drawing lead conservators to think that it was once framed. This is because the lines have the characteristic look of "acid burn." Wood is acidic, and used to be used as a backing material in frames. 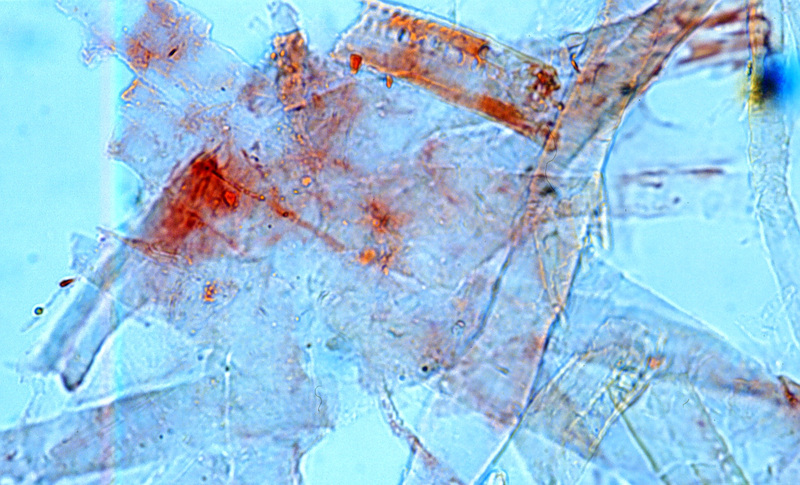 Paper, when it is in contact with acidic materials or acids, discolors. If it was framed, it could mean that it was once on display in the exhibition halls of the National Museum of Natural History. If this is true, then the drawing has institutional value as well as informational value (3). 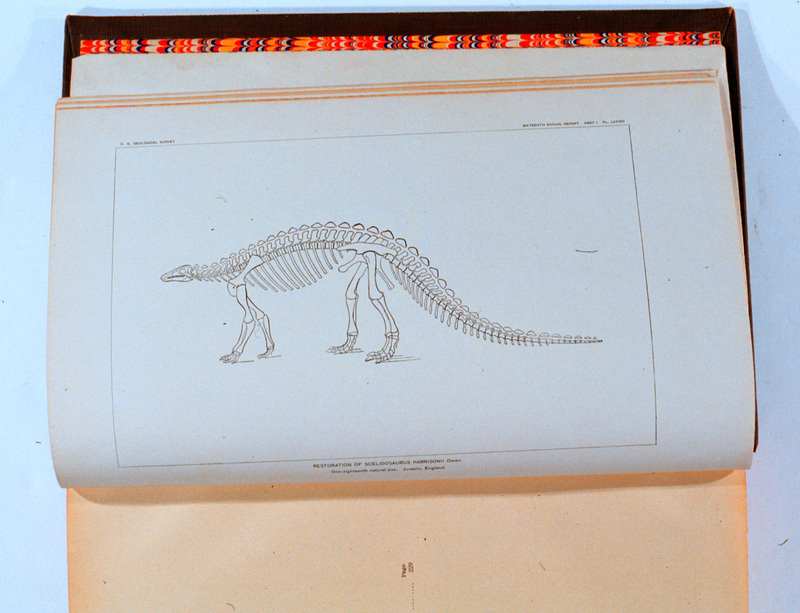 Book illustration, Scelidosaurus harrisonii, from Dinosaurs or North America (1896), edited by O.C. Marsh, Plate LXXXIII. Many of the drawings in the O.C. Marsh Collection were once published in scholarly journals. 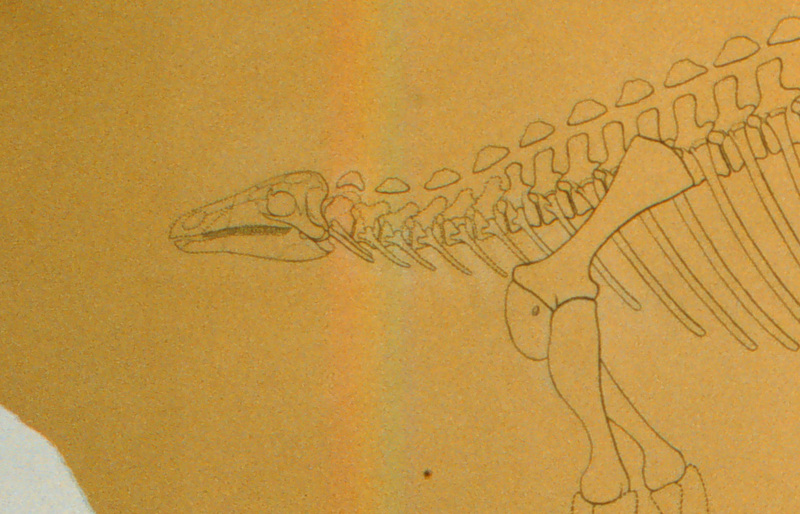 This drawing was published in Dinosaurs of North America (1896), at a significantly reduced size. Details of the drawing are hard to see, and sometimes obscured. Not only that, but the number of copies of this journal in circulation is very small, and the journal is printed on paper that is also in danger of deteriorating. There is no doubt that the original picture needs to be preserved for the future. Digitization of the image is one component of making the drawing accessible, but it will never be a preservation solution. In fact, digitization itself is not a permanent medium! Data is lost as technology moves forward and discards old formats and programs. The condition of the drawing is poor. When conservators study a drawing to determine how best to preserve it, they often take a "raking light" photograph. The light source is from the left or top of the drawing, and a gnomon is used to measure the angle of the light. 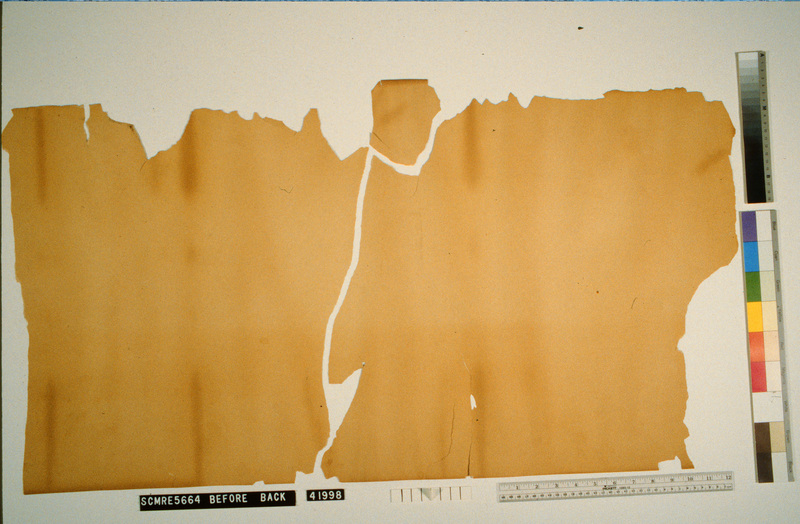 The light exposes the distortions in the paper caused by tears, cockling (which may be a result of moisture damage), or a history of poor storage. Examination with raking light shows that this drawing has significant tears that break the drawing into three pieces. When the drawing is repaired, another "after treatment" raking light photograph will document by comparison exactly what repair was done. Another technique that conservators use to determine what the picture is made of, or what damages might be on the picture, is ultra-violet illumination. Using a lamp source of ultra-violet radiation, the conservator can sometimes identify pigments used, or areas of paper foxing or mold, because the radiation is absorbed differently into the paper than we can see with our eyes. Ultra-violet radiation is damaging to most organic things, including humans. Care must be used to keep the exposure to the lamps to a minimum. 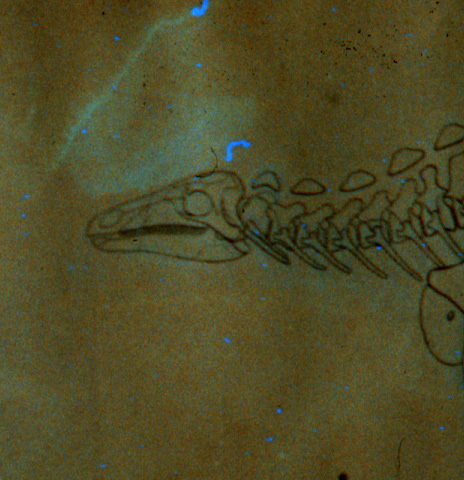 This photograph shows a fluorescing area above the head of the dinosaur, characteristic of changes in the surface of the paper, perhaps from erasure marks, mold attack or staining(image below shows a close up of the fluorescing areas). Why does paper survive for centuries or fall apart after only a few years? It depends on the basic fibers that make up the paper, and the things paper-makers added to the fibers during the manufacture. 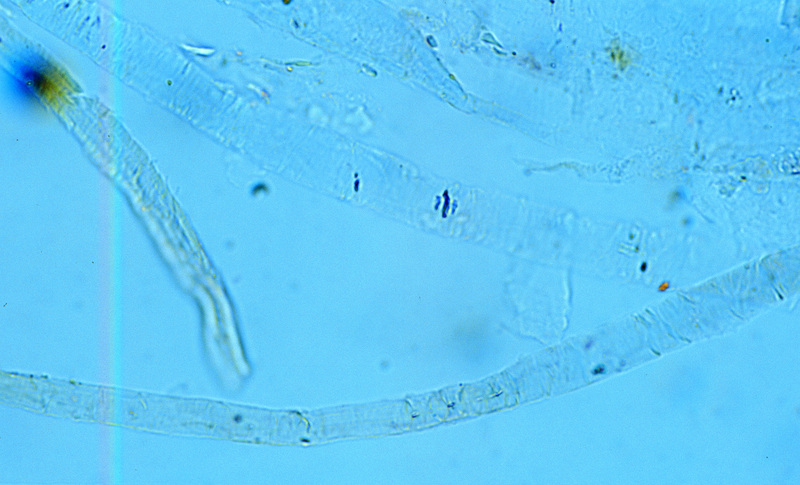 To help conservators make a plan for conservation treatment, a tiny sample of fibers (about the size of ·, or a grain of sand) is analyzed under a microscope. 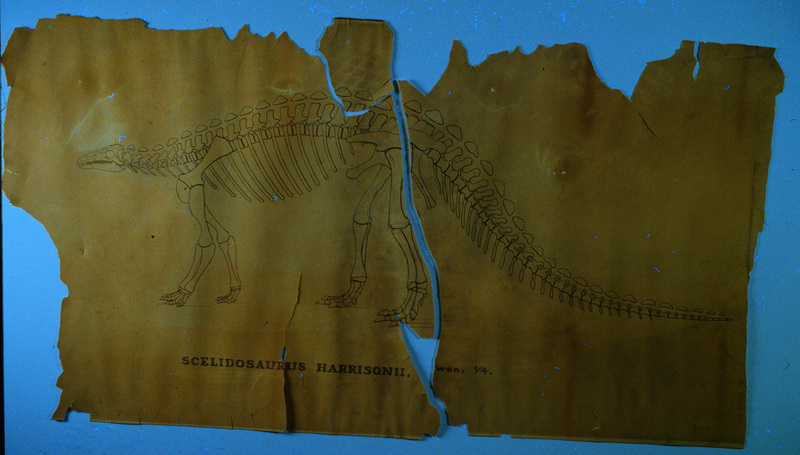 The illustration Scelidosaurus harrisonii was drawn on a mixed-pulp paper that has some wood-pulp in it. This can make an unstable paper that has a shorter life-span than stable papers. 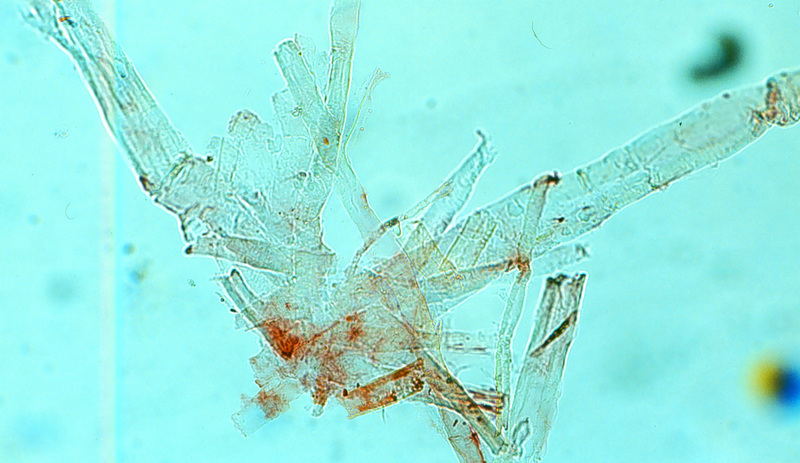 We know that this type of paper fiber was very common around the time that O.C. Marsh was publishing his research on dinosaurs. This is one of the ways we confirm that this is an original! For more information on paper-making, see the Preventive Care Course Material. Although digital images cannot capture all of the information about an object, it does have one remarkable feature; artifacts can be "virtually repaired" using graphic design software. This drawing is badly damaged and must undergo conservation treatment. However, with a half-hour at the computer the drawing can appear to be whole again. The drawing does not need to be touched and possibly further damaged. Before drawings can be digitized, they must be put into appropriate housing for handling and retrieval. Once they are in better storage, the drawings can be made available for conservation treatment, or for researchers to view them. Only after the drawings are safe from physical damage, can resources begin to be devoted to capturing the images electronically. A simple solution to safe storage is rehousing in specially made boxes. This box is made of an acid-free corrugated board which is put together using a safe, tested adhesive (polyvinyl acetate and methylcellulose 50:50), and book cloth. Closure straps are made of linen twill tape and sewn VELCRO® brand fasteners (4). 1. For more information about digitization of museum and research collections, see preservation duplication in "Preservation: Identifying Problems and Solutions Facing Paper-based Collections." 2. The pictures in this document were taken with a 35mm camera and Tungsten film. 35mm transparencies were then scanned into digital form. The following image was taken with an Apple Digital Camera at the highest resolution. The difference in appearance should be very obvious on your computer screen. 3. Value definitions are used to rank artifacts in a collection. For more information see Value Definitions Which Can be Ranked as High, Medium or Low. When a collection is selected for digitization, value plays an important role. See Selection Criteria for Archival Collections to be Digitized.